crew roared to life and rocketed away from the Baikonur Cosmodrome in Kazakhstan, kicking off the ninth expedition to the orbital outpost. Commander Gennady Padalka, NASA flight engineer Michael Fincke and European Space Agency astronaut Andre Kuipers blasted off at 11:18:57 p.m. EST Sunday (3:19 GMT Monday), from the same launch pad used by space pioneer Yuri Gagarin more than four decades ago. Despite a surprise weekend snow storm, the sky cleared off, the Soyuz climbed away on time and slipped into orbit eight minutes and 40 seconds later. If all goes well, the Soyuz TMA-4 spacecraft will dock with the space station around 1 a.m. EST Wednesday after a two-day orbital chase. "Congratulations on completion of the first stage of your flight," a ground controller radioed seconds after the Soyuz reached orbit. 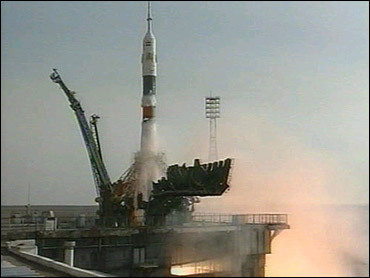 Live television views during the climb to space showed all three crew members in good spirits, smiling and waving at cameras, as they followed their checklists. "It took me a long time to breathe!" said Edward Fincke, the astronaut's father. "To see your kid sitting on a ball of fire going to the heavens, it's simply more than you can imagine, more than you can ask for. It's so great that NASA and the Russian agency let us be here today. Talk about a graduation day!" Padalka, 45, and Fincke, a 37-year-old Air Force lieutenant colonel, plan to remain aboard the outpost for six months as the lab's ninth full-time crew. Kuipers is scheduled to return to Earth on April 30 with the outgoing Expedition 8 crew, commander Michael Foale and flight engineer Alexander Kaleri.